Four men have admitted being involved in distributing thousands of pounds of illegal drug raids across Scotland. The gang’s guilty pleas at the High Court in Livingston followed a major police surveillance operation into serious and organised crime. Detectives filmed dealers and couriers using their cars to deliver heavy bags, eventually recovering cocaine, cannabis resin and herbal cannabis with a street value of £275,999. The total weight of cannabis resin recovered was 38 kilos valued at £217,000. Police also found 900 grammes of cocaine valued at £50,000 and 800 grammes of herbal cannabis worth £8,000. 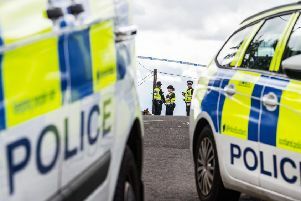 Officers who searched ringleader Neil Scott’s home in Meadowpark Crescent, Bathgate, found bundles of cash lying on open display on a desk in his downstairs study. The total amount recovered was £29,115 – £17,115 from the house and a further £12,000 in a black bag in his Audi Q7 car. Scott, who celebrated his 39th birthday in the dock today pled guilty to three counts of being concerned in the supply of controlled drugs. Andrew Raven (35) admitted carrying identical crimes at his home in Kingsfield, Linlithgow, which the gang used as a store for the illegal drugs. Police found 33 taped blocks of cannabis and a tub of white powder in the house and a bundle of herbal cannabis in the garden shed. They also recovered scales and other drug dealing equipment, all contaminated with cocaine. Ryan Ingleston (25), from Cumbernauld, North Lanarkshire, who pled guilty to being concerned in the supply of cannabis resin, confirmed to cops that he was a courier. Five blocks of the Class B drug were found in his Ford Kuga car. Andrew Weir (28) who was running a drug preparation operation at his home in Falside Crescent, Bathgate, pled guilty to being concerned in the supply of the Class A drug cocaine. The offences were all committed between November 19, 2015 and January 5, 2016, the day police acting on a tip-off swooped as Scott and Ingleston met to exchange drugs for cash in a car park at Bathgate Medical Centre. All four are now facing substantial prison sentences when they are sentenced at the High Court in Edinburgh on December 19.